Often copied but never equaled, the Audio Cable is now better than ever. Copper Shell - pure copper shell is integral forming, never falling off reducing more signal loss and noise than aluminum shell, making the sound more pure. Tangle free: NO more tangles Premium metal housing makes it impossible for our auxiliary cable to tangle. SLIM CONNECTOR: Slim connector 3.5mm stereo audio cable allows the 3.5mm stereo jack to be easily plugged into your headphone jack, no need to take off your smartphones or tablets bulky protective case. Ultra Durability - 10000+ bend lifespan several times is longer than most AUX Cables, soft TPE making it a flexible and long lasting cable. 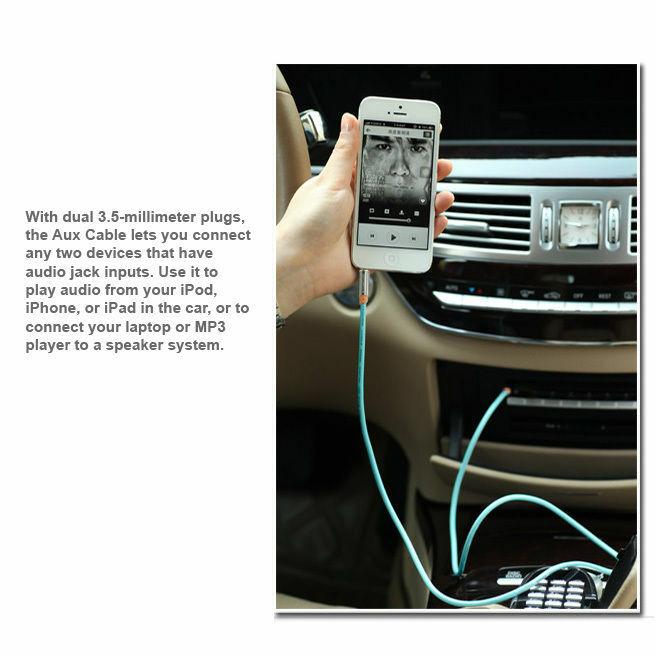 Widely Compatibility: 3.5mm male to male Audio cable is compatible for connecting portable audio devices: Car stereos,headphone,Beats,iphone,iPod,iPad ,Samsung Galaxy and other phone, tablets and MP3 players, portable speaker system or other 3.5mm-compatible output devices.